Disguised as law enforcement officers, gunmen murdered seven members and associates of George "Bugs" Moran's North Side gang at 10:30 in the morning of February 14, 1929. 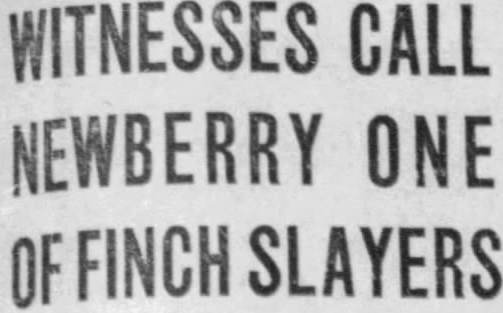 Chicago Tribune, Feb. 15, 1929. The North Siders were assembled at the SMC Cartage Company garage, 2122 North Clark Street. A team of professional killers, two of them dressed as police officers, entered the building. Believing they were being raided by authorities, Moran's men cooperated and lined up facing a wall of the garage. The helpless gangsters were then slaughtered in a hail of machine gun and shotgun fire. The killers escaped. Belvidere Republican, Feb. 14, 1929. Decatur Herald, Feb. 14, 1929. Uniontown PA Standard, Feb. 15, 1929. Boston Globe, Feb. 15, 1929. Gang boss Moran, said to be the primary target of the attack, also escaped. Lookouts working with the hit team mistakenly believed Moran was present in the garage and initiated the attack too early. According to reports, Moran was just approaching the building when he observed what looked to be a police raid and decided on a different course. When he learned of the massacre, he went into hiding. Minneapolis Star, Feb. 14, 1929. 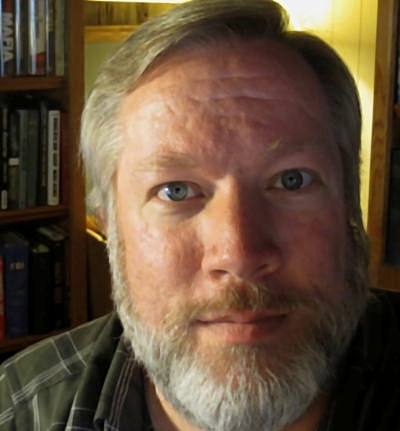 James Clark, 42. The top lieutenant of George Moran (and often referred to in the press as Moran's brother-in-law), Clark (born Albert Kachellek) had been imprisoned several times for robberies and parole violation. Frank Gusenberg, 36. Often a suspect in burglaries and robberies, he served one jail sentence for disorderly conduct. He was considered an enforcer for Moran. He was the only one of the seven victims still living when police arrived. He died hours later. Peter Gusenberg, 40. 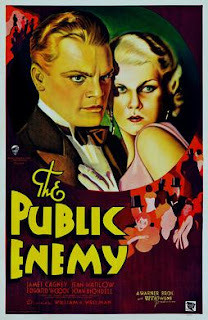 The brother of Frank Gusenberg, he was the top enforcer of the Moran bootlegging operation. He served several prison terms for robberies and parole violation. Adam Heyer, 40. He had been in and out of prison since 1908, convicted of robberies, confidence games and parole violation. It was reported that Heyer managed the gang finances and ran the S.M.C. Cartage Company. John May, 35. A former thief, he was an associate of the Moran gang and worked as a automotive mechanic. Albert Weinshank, 35. 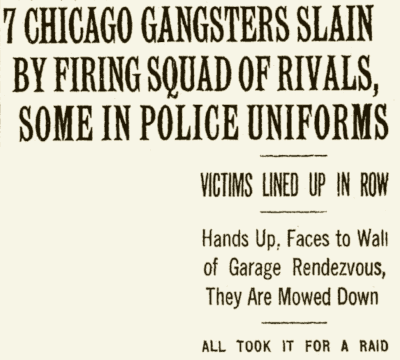 A member of the Chicago cleaning and dying association, authorities believed he joined the gang when Moran was scheming to take control of that industry. Reinhardt Schwimmer, 30. An optometrist, he often socialized with the Moran gang and bragged of his underworld association. New York Times, Feb. 15, 1929. Out-of-town gunmen working with Al Capone's Chicago Outfit are generally believed responsible for performing the massacre. "Doctor in massacre," Chicago Daily Tribune, Feb. 15, 1929, p. 1. "No one brought to trial for goriest gangland hit," Bloomington IL Pantagraph, Feb. 13, 1979, p. 6. 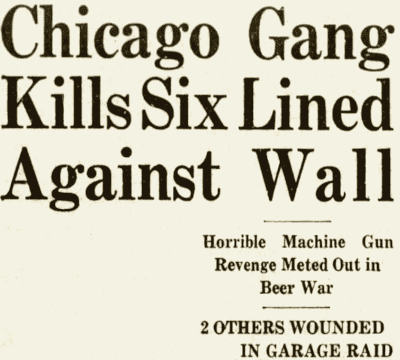 "Police records tell lives of gang slain gangsters," Chicago Daily Tribune, Feb. 15, 1929, p. 2. Binder, John J., Al Capone's Beer Wars, Amherst, NY: Prometheus Books, 2017. Gomes, Mario, My Al Capone Museum, myalcaponemuseum.com. Helmer, William J., Al Capone and His American Boys, Bloomington: Indiana University Press, 2011. Helmer, William J., and Arthur J. Bilek, The St. Valentine's Day Massacre, Cumberland House, 2006. Kobler, John, Capone: The Life and World of Al Capone, New York: G.P. Putnam's Sons, 1971. Koziol, Ronald, and Edward Baumann, "Chicago's grisly wall," Chicago Tribune, Feb. 13, 1987, p. 5-1. 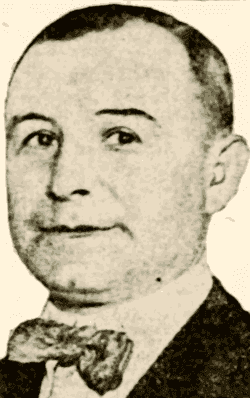 Chicago rackets boss Johnny Torrio, at liberty before beginning a nine-month sentence for Prohibition violations, was shot and seriously wounded in front of his home on the afternoon of January 24, 1925. The attack did not result in Torrio's death but it did effectively remove him from the Chicago underworld. Following weeks in the hospital and months in Lake County Jail in Waukegan, Illinois, Torrio sold his interests in bootlegging businesses and left Chicago. His top lieutenant, Alphonse Capone, took over Torrio's gang and built the Chicago Outfit. 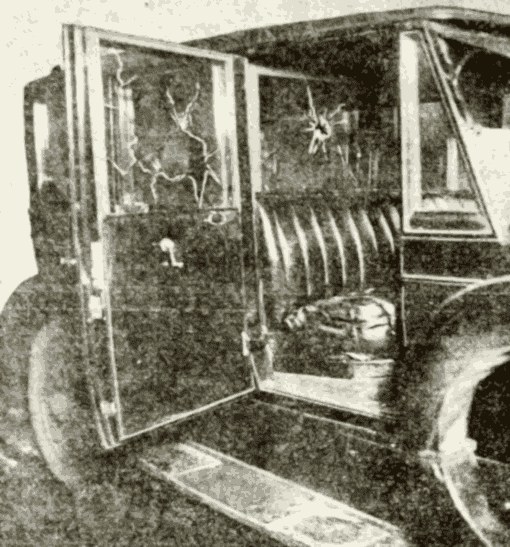 Bullet holes in the Lincoln auto used by the Torrios. John Torrio, czar of bootlegging and vice in Chicago, was shot five times yesterday in front of his home, 7011 Clyde avenue. He is expected to recover. The assailants escaped. The police and the underworld are convinced they are gangsters loyal to the memory of Dean O'Banion, the beer runner who was murdered in his flower shop two months ago. O'Banion had challenged Torrio's control of beer running and was killed by Torrio's men, police are certain. Torrio attended O'Banion's wake. His presence was interpreted by the underworld as a warning to any who challenged him that they might expect to sleep in silver-bronze caskets surrounded by thousands of dollars worth of flowers. But Torrio's enemies were not cowed. A week ago they tried to assassinate his first lieutenant, Al Capone. That attempt failed. Yesterday three of them lay in wait for half an hour opposite the Torrio home, waiting for Torrio to return. 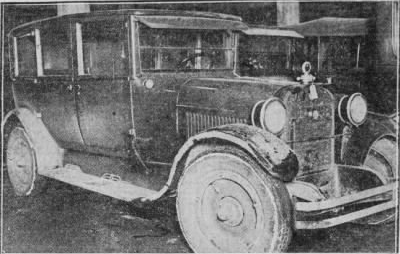 At 4:30 o'clock Torrio and his wife, Anna, drove up in a heavy sedan. While one of the gunmen remained at the wheel, the other two jumped out and shot Torrio, who tried to escape by running into the apartment building. The attackers leaped back into their machine and fled. The newspaper noted that Torrio left the country for a time following O'Banion's wake. It said that he and his wife traveled to Hot Springs, Arkansas, before embarking for Havana, Cuba, and then reentered the U.S. at St. Petersburg, Florida, before returning to Chicago. The Tribune suggested that friends of O'Banion followed them every step of the way, waiting for an opportunity to avenge O'Banion's murder. The trip outlined by the newspaper was not out of the ordinary for the Torrios, who frequently traveled inside and outside the U.S. (Their visit to Havana following O'Banion's death was documented by a passenger manifest of the S.S. 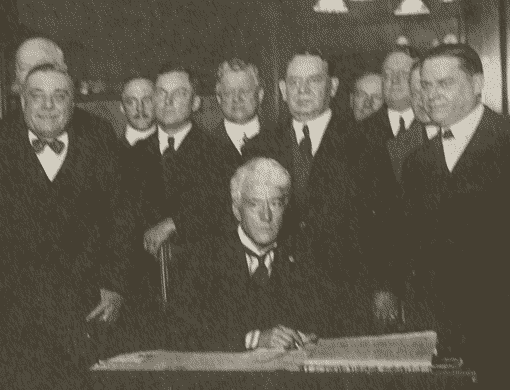 Governor Cobb, the ship that brought them from Cuba to Florida on December 13, 1924.) But it is odd that Torrio was permitted to leave the country between his May 19, 1924, arrest on federal Prohibition charges and his January 17, 1925, sentencing. Anna and John Torrio pulled up to their apartment building on January 24 in a chauffeured Lincoln automobile borrowed from a friend. Anna stepped out of the car and walked to the apartment steps, while John gathered a bunch of packages from the vehicle. Two gunmen - one carrying a shotgun and the other a handgun - climbed out of a gray Cadillac around the corner, approached Torrio and opened fire. Torrio made a dash for the building but fell to the sidewalk. The gunmen escaped in their Cadillac. The chauffeur of the Lincoln, wounded in the knee by a bullet, drove off as the first shots were fired. He was later found and questioned by police. He refused to discuss the shooting. Torrio, wounded in the chest, arm and jaw, was treated at Jackson Park Hospital. He also refused to provide any information to investigators. According to the Tribune, he told Assistant State's Attorney John Sbarbaro, "I know who they are. It's my business. I'll tell you later." The paper reported that Alphonse Capone was in tears when he rushed to his boss's hospital bed. After Capone made arrangements for Torrio's care and safety, he was taken in for questioning. As a result of the shooting, federal authorities postponed for thirty days Torrio's scheduled January 28, 1925, entry into DuPage County Jail in Wheaton. Just two weeks later, however, Torrio said he was sufficiently healed to begin his sentence. He requested that he be allowed to serve his time at Waukegan in Lake County, which would be better able to treat any health complications. Federal officials found the request suspicious but granted it. Allowing for a sentence reduction of forty-five days for good behavior, Torrio's sentence expired near the end of September. His release was held up when some accused the Lake County sheriff of providing Torrio with illegal privileges during his incarceration. It was said that Torrio had his own comfortable furniture placed in his cell, was permitted to possess a loaded automatic pistol for his defense and even repeatedly left the jail for nights out in the company of the sheriff. Torrio remained in custody as hearings were conducted into the actions of the sheriff. He was released on a $5,000 bond on October 6, as federal Judge Adam C. Cliffe considered the evidence. 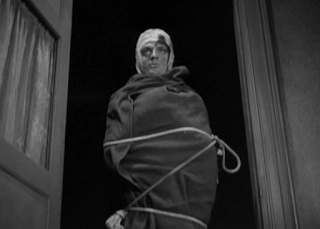 Cliffe decided a few days later that there was insufficient proof of any wrongdoing. Torrio left Chicago almost immediately after the judge's decision. John and Anna Torrio set out again that fall for Havana. They traveled with Alphonse Capone and his wife Mae. All four indicated that they lived in New York. They returned to the U.S. together through Key West, Florida, on November 14, 1925. Capone went back to Chicago as a newly appointed underworld boss. The Torrios headed to an apartment on Shore Road in Brooklyn, where John Torrio continued his involvement in liquor-related rackets. In 1939, he was sentenced to two and a half years in federal prison for evading income taxes. Upon his release from Leavenworth, he worked in real estate. He reportedly died of a heart attack while in a Brooklyn barber's chair on April 16, 1957. He was seventy-five years old and had outlived his far more notorious protege Capone by nearly a decade. Torrio's death went unnoticed by the media until more than two weeks later, when his will, leaving an estate estimated at $200,000 to his wife, was filed in Brooklyn. "Al Capone's mentor dies of heart attack," Bloomington IL Pantagraph, May 8, 1957, p. 1. "Chicago police make big haul in war on beer," Freeport IL Journal-Standard, May 19, 1924, p. 1. "Denies Torrio's plea," Chicago Sunday Tribune, Sept. 27, 1925, p. 2. "Drop Torrio inquiry," Decatur IL Herald, Oct. 9, 1925, p. 1. "Johnny Torrio gets 2 1/2 years," Brooklyn Eagle, April 12, 1939, p. 1. 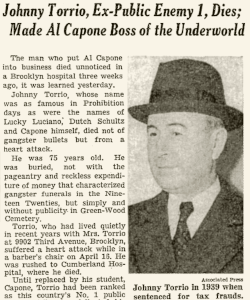 "Johnny Torrio, ex-bootlegger who gave Capone start, dies," Richmond IN Palladium-Item, May 8, 1957, p. 9. "Johnny Torrio, ex-public enemy 1, dies; made Al Capone boss of underworld," New York Times, May 8. 1957, p. 32. 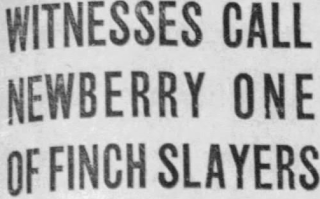 "O'Bannion, arch gunman, killed," Decatur IL Daily Review, Nov. 11, 1924, p. 1. "Pistol kept in cell," Cincinati Enquirer, Sept. 29, 1925, p. 3. "Scarface Al Capone, ex-king of crime, dies," Brooklyn Eagle, Jan. 26, 1947, p. 1. "Torrio and 2 aides admit tax frauds," New York Times, April 11, 1939, p. 1. "Torrio free on bonds pending contempt edict," Chicago Daily Tribune, Oct. 7, 1925, p. 12. 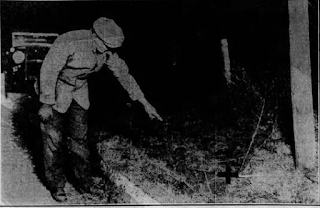 "Torrio is shot; police hunt for O'Banion men," Chicago Daily Tribune, Jan. 25, 1925, p. 1. "Torrio offers $10,000 if jail lark is proved," Chicago Daily Tribune, Sept. 18, 1925, p. 1. "Torrio under heavy guard as he quits jail," DeKalb IL Daily Chronicle, Oct. 7, 1925, p. 1. "Torrio's power in rum ring bared," New York Times, April 1, 1939. "U.S. is wary of Torrio's request for jail tonight," Chicago Daily Tribune, Feb. 9, 1925, p. 3. 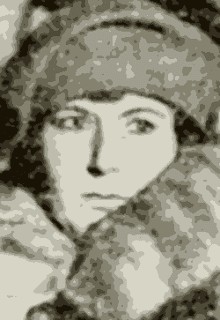 "Woman involved in Dion O'Bannion's murder in Chicago," Brooklyn Eagle, Nov. 11, 1924, p. 3. Gordon, David, "Torrio admits guilt, halts tax evasion trial," Brooklyn Eagle, April 10, 1939, p. 1. John Torrio World War II Draft Registration Card, serial no. U1962, Local Board no. 171, Brooklyn NY. Passenger manifest of S.S. Cuba, arriving Key West, Florida, on Nov. 14, 1925. Passenger manifest of S.S. Governor Cobb, departed Havana, Cuba, on Dec. 13, 1924, arrived Key West, FL, on Dec. 13, 1924. Peterson, Virgil, "Inside the Crime Syndicate (No. 2)," Chicago Sunday Tribune Magazine, Oct. 14, 1956, p. 28. Stelzer, Patricia Jacobs, Prohibition and Organized Crime: A Case Study, An Examination of the Life of John Torrio, master's degree thesis, Dayton OH: Wright State University, 1997, p. 7. Federal Judge James H. Wilkerson on October 24, 1931, sentenced Chicago Outfit leader Al Capone to eleven years in prison and a $50,000 fine for evading income taxes. Capone also needed to pay $215,000 in back taxes plus interest. One week earlier, a jury convicted Capone on five tax counts. Capone was found guilty of the felonies of evading taxes for the years 1925, 1926 and 1927, and of the misdemeanors of failing to file income tax returns for 1928 and 1920. The jury did not convict on counts relating to tax evasion in the years 1924, 1928 and 1929. Judge Wilkerson sentenced him to five years in federal prison on each of the felony convictions, with two of those sentences to run concurrently. He added a year in Cook County Jail for the two misdemeanors. Capone had already been locked up in county jail for contempt, after it was shown that he pretended to be ill in order to avoid appearing before a federal grand jury. As he returned to county jail after sentencing, Capone was in an angry mood and threatened a reporter who tried to photograph him: "I'll knock your block off." Later he pleaded with newsmen to put their cameras away. "Think of my family," he said. Capone was refused release on bail pending the legal appeals in his tax evasion case. He brought his request for bail to the U.S. Circuit Court of Appeals but that was denied on October 27. When his appeals were exhausted, with the Circuit Court's affirmation of his sentence in February 1932 and the U.S. Supreme Court's early May 1932 refusal to review his case, Capone was moved from Cook County Jail to Atlanta Federal Penitentiary. His ten-year federal prison sentence would allow his release on good behavior in seven and a half years. Capone's term in Atlanta was relatively brief. In the summer of 1934, he was transfered to Alcatraz Prison on the West Coast. His health deterioriated at Alcatraz. When he was freed from custody in November 1939, he was immediately placed in a Baltimore hospital for treatment of paresis. His final years were spent in retirement at Palm Island, Miami Beach, Florida. He died January 25, 1947. "Capone gets writ; sent back to jail until appeal made," Bloomington IL Pantagraph, Oct. 27, 1931, p. 1. 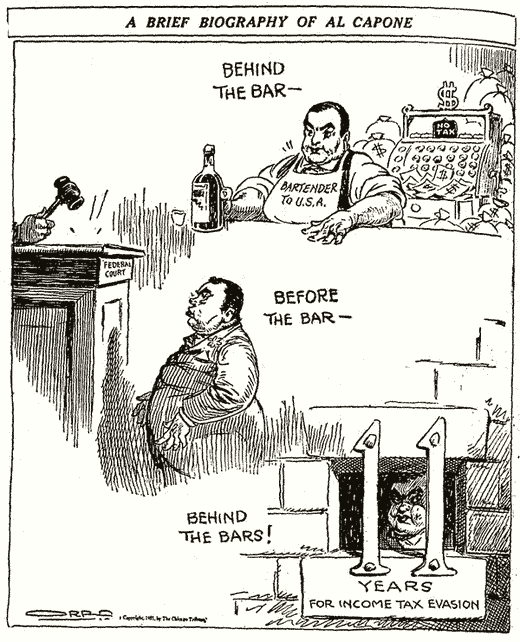 "Capone in jail; prison next," Chicago Daily Tribune, Oct. 25, 1931, p. 1. "Capone loses his last chance to keep out of pen," Ogden UT Standard Examiner, May 2, 1932, p. 1. 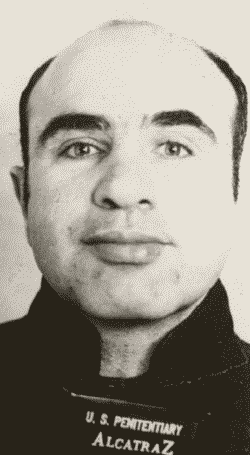 "FBI History: Famous Cases: Al Capone," Federal Bureau of Investigation, accessed June 27, 2010. https://www.fbi.gov/history/famous-cases/al-capone (previously: http://www.fbi.gov/libref/historic/famcases/capone/capone.htm). "Prison tonight for Capone," Chicago Daily Tribune, May 3, 1932, p. 1. Certificate of Death, Florida State Board of Health. Florida State Census of 1945. 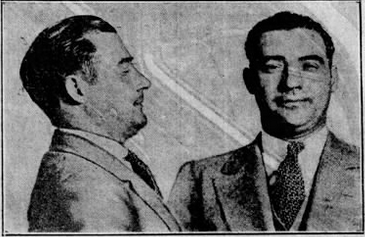 Kinsley, Philip, "U.S. jury convicts Capone," Chicago Daily Tribune, Oct. 18, 1931, p. 1. Pickard, Edward W., "Chronology of the year 1931," Woodstock IL Daily Sentinel, Dec. 30, 1931, p. 3, and DeKalb IL Daily Chronicle, Dec. 31, 1931, p. 6. Prisoner Index, Alcatraz Federal Penitentiary. 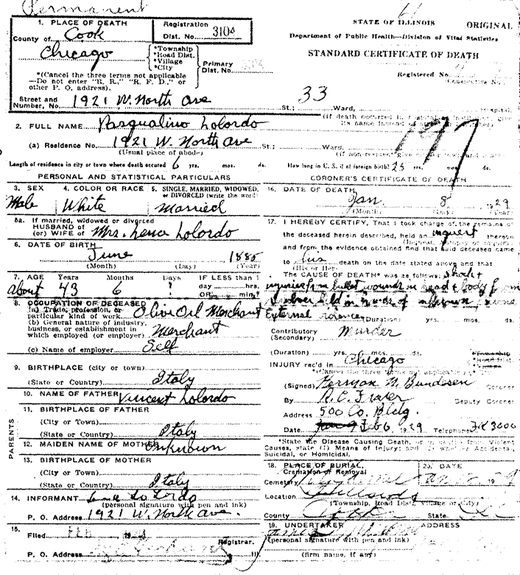 United States Census of 1940, Florida, Dade County, Miami Beach, Enumeration District 12-42A. 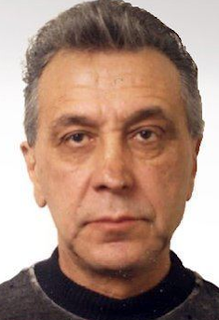 John DiFronzo, reputed boss of the Chicago Outfit, died Sunday, May 27, 2018, at his home in River Grove, according to published reports. (Chicago Tribune reports he died May 28) He was eighty-nine years old. Criminal defense attorney Joe Lopez told the media that the crime boss suffered with Alzheimer's disease and had been "extremely ill."
DiFronzo was widely suspected of involvement in the brutal 1986 murders of brothers Anthony and Michael Spilotro (depicted in the film Casino). His role was discussed during the 2007 Family Secrets trial of Outfit leaders. But DiFronzo was not a defendant in Family Secrets, and federal prosecutors were unable to assemble a convincing case against him. Attorney Lopez told CBS-Chicago that DiFronzo's greatest achievement was "beating the G."
on the American Mafia history website. 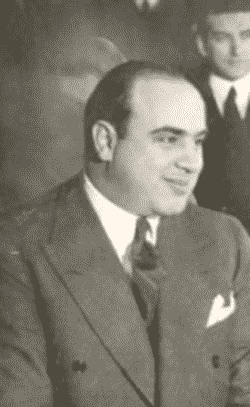 Al Capone, notorious Prohibition Era gang boss of Chicago, died January 25, 1947, at his south Florida home. Dr. Kenneth S. Phillips, who had treated the retired crime figure for years, announced that death was caused by pneumonia and heart failure, complications of a recent stroke. For many years, Capone had dealt with the symptoms of advanced syphilis. Immediately upon the November 1939 expiration of his long prison sentence for tax evasion, Capone was admitted into Union Memorial Hospital in Baltimore for treatment of paresis. The former gangland boss, burdened with an ailing body and a failing mind, never returned to command the Chicago Outfit organization he built during Prohibition, instead moving into a quiet Florida retirement. Capone suffered an apoplectic stroke at about four o'clock in the morning of January 21, 1947, just a few days after his forty-eighth birthday. It was feared that the unresponsive Capone would soon die. At six o'clock, a Roman Catholic priest, Monsignor William Barry, went to the twenty-five-room estate, 93 Palm Avenue on Palm Island in Biscayne Bay, to administer the last rites. Newspapers learned of the stroke and scrambled to cover the final moments of Capone's life. By eight o'clock that morning, Dr. Phillips saw some signs of improvement in his patient. At the family's request, the physician became a spokesman, delivering health updates to the swarm of reporters gathering outside the walls around the estate. Capone regained consciousness later in the day, and Dr. Phillips reported to the press that he could speak, though the doctor urged him to remain quiet and rest. Dr. Phillips told the press on January 23 that Capone continued to show progress in his recovery. The doctor expressed concern that the stroke might leave Capone paralyzed on the left side. "It'll be two or three days before I can tell conclusively about his condition," Dr. Phillips said. "He's doing just about the same and it looks like he is out of danger if there are no unforeseen complications." The possibility of pneumonia was discussed early the following day. Dr. Phillips reported that Capone was "harboring considerable lung congestion." The patient's condition worsened quickly. Dr. Phillips rushed to Palm Island that afternoon and returned with Dr. Arthur J. Logie, a Miami-based chest specialist, that evening. Dr. Logie met with reporters as he left the estate. The specialist's prognosis was grim. "I doubt very seriously if there is a chance for recovery. It is impossible to say how long he will last. His lungs are pretty well filled... Both lungs are badly congested and his heart has begun to fail." The doctors administered oxygen, using tanks and equipment brought to the Palm Island home. Press reports the following day suggested that Capone would already be dead if not for the oxygen pumped into him during the night. Dr. Phillips and Capone's wife and son were with Capone when he died in his bed at twenty-five minutes after seven on Saturday night, January 25. As he passed, his wife collapsed and required the attention of Dr. Phillips. The doctor emerged from the estate with news of Capone's death at about eight-thirty. Capone was survived by his wife and his son, both of his parents, two brothers and a sister. His body was taken to the W.L. Philbrick Funeral Home at Miami Beach. Reports indicated that Louis Rago, funeral director at 624 N. Western Avenue in Chicago, flew to Miami Beach to take charge of arrangements, as the family wished for Capone to be buried in a plot in Mount Olivet Cemetery in Chicago. "Ex-Gangland chief rallies after stroke," Moline IL Dispatch, Jan. 22, 1947, p. 1. "Hint Capone's left side may be paralyzed," Chicago Daily Tribune, Jan. 24, 1947, p. 6. "Doctor speeds to bedside of Al Capone," Miami Daily News, Jan. 24, 1947, p. 23. "Al Capone hit by pneumonia, heart weaker," Baltimore Sun, Jan. 25, 1947, p. 3. "Al Capone gets pneumonia, doctor doubts recovery," Brooklyn Eagle, Jan. 25, 1947, p. 1. "Capone dying, doctor says," Chicago Daily Tribune, Jan. 25, 1947, p. 1. Sosin, Milt, "Capone under oxygen mask, hovers on brink of death," Miami Daily News, Jan. 25, 1947, p. 1. "Capone dies at island villa," Miami Daily News, Jan. 26, 1947, p. 1. 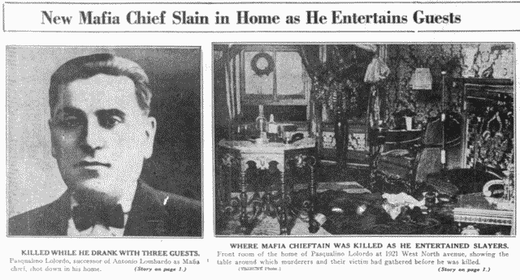 "Al Capone dies in Florida villa," Chicago Daily Tribune, Jan. 26, 1947, p. 1. "Al Capone, gang czar, dies," Des Moines Register, Jan. 26, 1947, p. 4. Writers of Wrongs: "Out of prison, into hospital." On this date in 1929: Chicago underworld leader and olive oil merchant Pasqualino "Patsy" Lolordo, forty-three, was shot to death by visitors to his apartment, 1921 W. North Avenue. Lolordo welcomed three guests at about three o'clock in the afternoon and shared drinks and conversation with them in the livingroom for an hour. At four o'clock, his thirty-eight-year-old wife Lena, tending to the ironing in the apartment kitchen, heard gunshots and ran to the livingroom. She brushed past the visitors on her way to her fallen husband. The visitors left quickly and quietly. 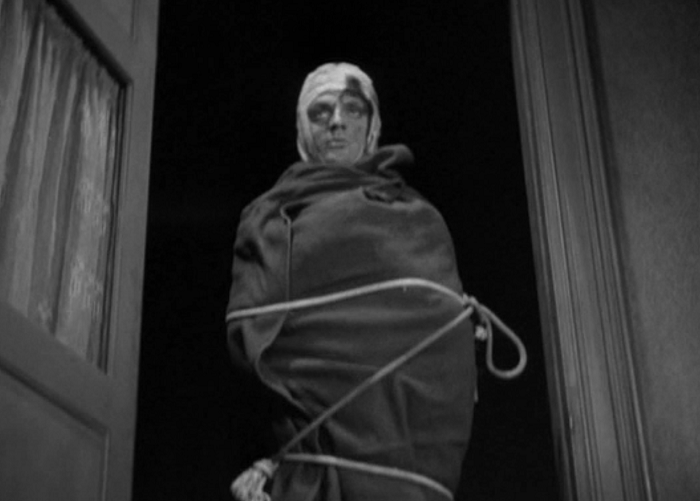 Lena grabbed a velvet pillow and placed it under the dying man's head. Lolordo succumbed to gunshot wounds to his skull, neck and shoulders before an ambulance arrived. Police found an empty .38-caliber pistol on the building stairway and another near Lolordo's body. Three half-filled drinking glasses sat on a livingroom table. A broken glass was in Lolordo's lifeless hand. Police determined that Lolordo was unarmed when he was shot, though they found a sawed-off shotgun in his bedroom. 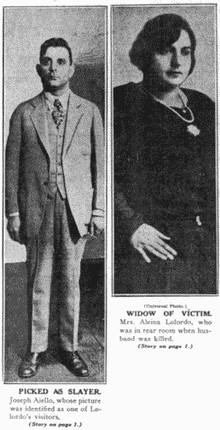 Eighteen men, believed to be members of the Joe Aiello bootlegging gang, were viewed by Lena Lolordo, but she recognized none of them as her husband's visitors. Later, she picked out a photograph of Aiello himself, saying he was one of the gunmen. 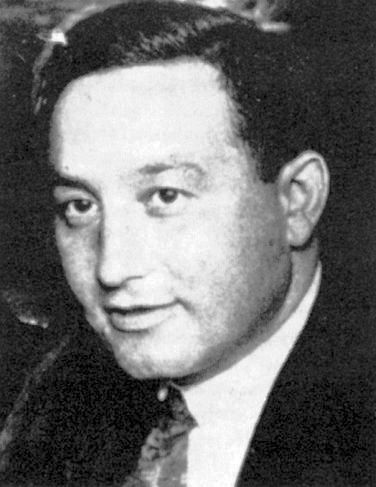 Several months earlier, Lolordo had succeeded the murdered Antonio Lombardo as leader of Chicago's gangland-linked Unione Siciliana organization.